The wide range of ladderm8rix products gives lots of variety when it comes to ladder safety. 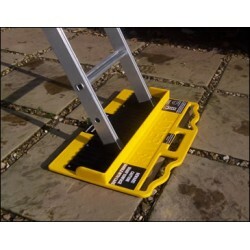 The main function of the m8rix ladder base anchor is to offer support by fixing the base of the ladder in position giving the user the ability to work without worrying about slipping. This diverse system can work on a large variety of surfaces such as concrete, grass, tiles, decking, paving slabs, snow, tarmac and even ice. This device is perfect for these surfaces due to its unique design, carrying a 2000 pin base that will penetrate surfaces for top security The Ladder m8rix is perfect for maximizing safety when using Ladders at the workplace or at home. Recently this safety device was put through tough tests to prove its worth by local authorities where it received great praise. To prevent workplace accidents and injuries the m8rix has been adopted by leading telecom companies across the UK With numerous "star of the show" awards coupled with "best new DIY home improvement and garden tools product" this again can only prove how valued this product is.